Kalij pheasants are common on Hawaii's Big Island in forests between 1000 feet (305 m) to 7,500 feet (2,286 m) of elevation. 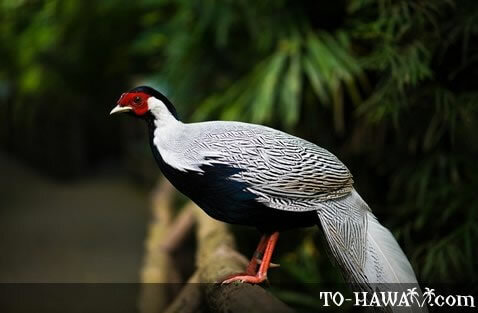 Native to South Asia, they were introduced to Hawaii in 1962. They can be seen along forested roadsides and on the slopes of Mauna Kea, Mauna Loa and Hualalai. Adult males are bluish-black in color with grey feathers on their breast. Adult females have light and dark brown feathers. Both sexes have bushy V-shaped tales.